“Lau mam” is a southern specialty and an amazing marriage of preserved fish and hot-pot as well. Guests are certain to love it at the first sight due to the eye-catching beauty of large dishes of colourful vegetables and the favour of the broth, made from salted fish that is cooked until its meat and bone are separated, greasy and sweet-smelling. 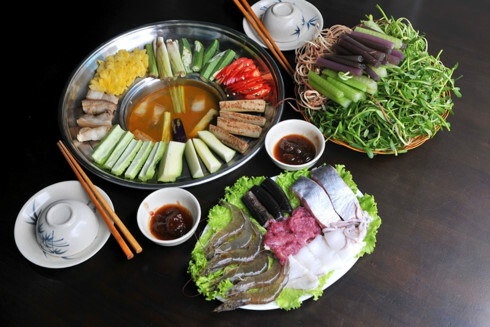 Fresh fish meat, water crab meat, snails, eel, slices of pork, silver shrimp accompanied with various kinds of vegetables, such as eggplant, bitter melon, water dropwort, “dien dien” flower , giá đậu, water lily, straw mushroom will be dipped into the boiled sauce until well-done. Vì lý do này, “Lau mam” is considered as one of the ideal dishes for vegetable-lovers. The more things are added, the more moreish the stock is. “Lau mam” is scoop out into bowls and served with handfuls of rice vermicelli also. Enjoying the winter bitter cold with a hot salted fish hotpot, a medley of flavors, spicy, đắng, mặn, sweet and greasy is not a bad idea!